I promise that this is, in fact, a Charlie and Ariel blog... searching and applying for jobs (while not far from a full-time job in and of itself) leaves me with a little more down time than Charlie has had recently to post updates. I’m sure than when our internet is up and running, you’ll hear from him a little more frequently. Aside from all the moving in and job-hunting stuff, we’ve been pretty busy since we arrived. To begin, as an amazing welcome to Boise gift, Brian and Marsha (friends of the Varlands), gave Charlie and I tickets to attend a performance of Arthur Miller’s The Crucible, put on by the Idaho Shakespeare Festival. It was an impressive show. The acting was exquisite, and the subject, though a little somber for a typical Fourth of July, was poignant and thought-provoking. The setting for their plays couldn’t have been more perfect. The performances take place around sunset, a little outside of town, in a sleek amphitheater tucked into a bend of the Boise river. Before the show, you package up a picnic (including beer or a bottle of wine! ), and bring it and your blanket or lawn chairs to the theater. The seating is terraced, and you can find your assigned grassy plot, and set up camp. They also have tables and chairs set up further back for those less naturally-inclined (or with more extravagant picnics). Watching live theater in the cool night air (a relief after those 100-degree days! ), with a bottle of wine and picnic is really about as good as it gets. I can appreciate why it’s such a beloved staple of Boise culture. We’ve done a little biking up and down the Greenbelt (probably 5 miles in each direction, east and west), and have taken several walks around the North End (the historic district our apartment borders upon). It’s interesting to see a climate so different from that which we’re accustomed. Cottonwood trees thronging the river banks, "puncture vines" (still not sure what they are specifically except that they sound BAD) in the open areas surrounding the bike trail, and dry, dry, dry once you get away from the river. Despite all my "woe is me" over the brown hills and the lack of count-able trees, the countryside here is growing on me. The hills not sit in my mind as more "golden" than brown, and the scarcity of trees outside of the city makes the ones we have here a little more special. Part of my "coming around" might have had to do with the short little hike Charlie and I took up at the Bogus Basin ski area a couple weeks ago. We drove up on a Friday (before he started work) and wove our way through the summer version of ski runs (dirt trails and double-tracks) to the top of the Schafer Saddle. Our trail was choked with wildflowers and thick with butterflies. To the north and east we could see acre upon acre of woods and mountains. To the south and west, dry, flat, "golden." We really do live on the edge of where the climate changes from one to the other. It’s a unique place. We had a nice picnic on the summit and enjoyed the views of the Treasure Valley and the Sawtooth Mountains. Given my skiing ability (or pronounced lack thereof), upon looking at the signs for the different runs up there at the top I gave that view an extra-hard look--it could be the only season in which I’m able to enjoy it. Unless, of course, they start allowing people to ride the lifts up and then back DOWN again. Most recently, we were able to catch the Twilight Criterion bike race in downtown Boise. The final two races of the day (the ones we made it there for) were the top women and men racing that night--for those bike folks "in the know" I believe I heard someone say that the top riders were Category 2 racers. Included among them was Kristen Armstrong who walloped the ladies’ field in her final race before the Beijing Olympics. We had a great spot on the last corner before the finish line, and were thoroughly impressed by how fast and how nimble everyone rode. Ms. Armstrong in particular was outstanding. By the end of the race, she had left the pack in the dust--lapping them on her way to the finish line. I sent a text message to one of my bikey friends back in Portland exclaiming over this feat. Her response was "Wow, she must be a professional." It was later that we realized we’d seen someone headed for the Olympics. Explained a lot. The men’s race was also exciting, though from our position it was difficult to tell how many laps they had left or how close they were to one another at the finish. Not exceedingly familiar with the competition, it also made it difficult to keep track of who was ahead and to not lose them in the pack. Despite that, the teamwork and strategy involved in the race was apparent, and we had a fantastic time watching it all unfold (even though we may not have completely understood what it was we were seeing at all times). This coming weekend, we’re planning on putting together a short hike and overnight up in the mountains somewhere. We had some exciting thunderstorms blow through yesterday, so we’ll have to do some research and make sure there’s nothing washed out or burning where we intend to head. I think that we’re both excited to get out of the city (at last!) and see a little more of the state that we now call "home." Some photos from the moving in process. I've uploaded a whole slew of photos to my flickrstream. You, of course, can see the entire batch of our moving pictures there. In the meantime, however, here are a select few to flesh out the longer post below. This is at our first break in The Dalles. Charlie's wearing the awesome Woodpecker Trucking cap his parents found for him. 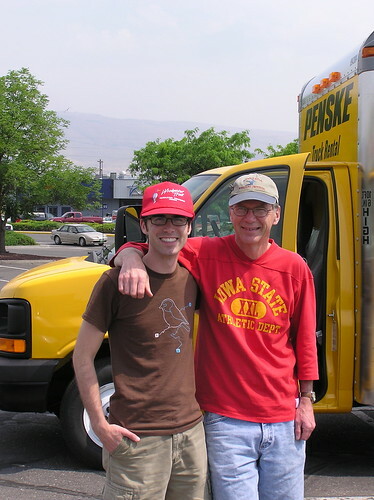 It matches the giant Penske truck (for the record, I wussed out and refused to drive that truck AT ALL; Charlie is the real champ for driving it across Oregon and into Idaho). Thank goodness for the fact that Charlie and I are cohabitating. This picture proves my crazy plant-lady tendencies. My car was packed to the gills with plants, cleaning supplies, and the cat. All I need now is a scary Ms. Havisham cake. We ended up having quite a bit of furniture that needed assembling. Our new Ikea loveseat is included in the tally. It was far simpler to put together than the cube of materials and 30-page booklet may have implied. We were even able to put it together as our brains slowly melted into the new hot weather. NICE, isn't it? This was our scary view for the first couple of days. It looks like a garage! I think it's safe to say that it doesn't look like this any longer. I've taken the first couple of photos of the "finished" rooms, and will be getting them up here before long. Updates since the prior post. Even though the internet drama is still in the works (the internet is in a box on our couch, our property manager has verified that we have no normal phone jack, and she’s calling the owner and the phone company to see what happens next), I decided it was only fair to take a little time to type up a few observations about moving in, our experiences so far in Idaho, and getting used to living in an apartment again. 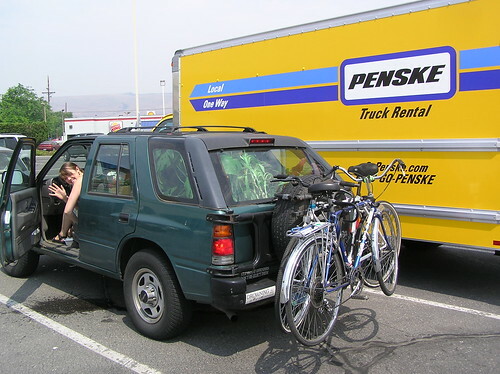 To begin, we had such a welcome send off from Portland and arrival in Boise on our moving day. Charlie’s mom and dad drove down to Portland so that his dad could assist us in driving our two cars and the moving van cross-state. It was such an amazing help to have that third person for the driving. We made a quick stop for a lovely warm breakfast (both the food and the people!) at the home of relatives of Charlie’s that live in Hillsboro, Oregon. After hugs and bon voyages, we hit the road. There’s not a ton to say about being on the road. We drove. And drove and drove and drove. I’d had a bad experience the night before at an Oil Can Henry’s in which they essentially told me my car wouldn’t make it back to my house that night—let along all the way to Idaho!—so I was a little anxious about that most of the way. Suffice to say we made it here just fine. The cat survived the trip, too. We wedged the carrier into the front seat next to me, and he alternately meowed indignantly and slept with his back to me for the entire eight hours. When we arrived here in Boise, family friends of Charlie’s showed up with tennis shoes and open arms and helped us unload the van. It was such an amazing help. We had six people in total helping us carry boxes from the street into our apartment. After spending the better part of two days painstaking loading things into the van, it was remarkable how fast we were able to empty it out. We then all hoofed it up to a bar and grill just up the road for a beer and a light dinner. After all the driving, and then a little drama with our apartment keys (the post office started forwarding my mail two days early, and thus the priority mail package containing our keys never made it to us in Portland—fortunately, our property manager lives within walking distance and could bring extra keys over), it was amazing to just relax and enjoy good food and such welcoming company. Beyond that, our first week was concerned primarily with unloading boxes and trying to find things like clean underwear and the little Ziploc baggies we’d packed full of our furniture assembling hardware. In the process of opening and breaking down boxes, it was hilarious how many knives accumulated all around our house. We decided that 1) we felt exceptionally safe in case of a home intrusion (there were weapons hidden everywhere!) and 2) it would have been an excellent setting for an action movie (weapons hidden everywhere, boxes to back flip over). Sharp pointies aside, Otto settled right in, and we utilized our AC only a few times as we got used to a standard daily temperature of over 90 degrees. The other night, taking an evening walk, Charlie and I noted that since we’ve been here, it’s been sunnier than you can even imagine—we haven’t even had a single, fully cloudy day. Two weeks of exclusively sunny days. All sun, all the time. Readjusting to apartment life has been… amusing. As it turns out, we’ve had a rock band (real, not video game) living in the basement apartment just below us. Fortunately, they sound awesome and they shut down practices by 9:00pm. Unfortunately they like to play loud and their drums are just below our dining room/library room. It’s also taken us a while to get used to the number of smokers in our building. They can’t smoke in the building, but it certainly wafts into the windows when they smoke in the rear courtyard. Finally, there’s a screamer in the building. We’re talking Herbal Essences, full blown best-experience-of-my life type of screamer (if you know what I’m insinuating). At least we know everyone is happy, right? Everyone has been so friendly and welcoming. We’ve met almost all our neighbors, and they’re all exceptionally nice. The people above us invited Charlie up for a barbeque on the roof (I was feeling a little under the weather so declined), and the people (non-band people) in the other basement apartment complimented how good our food always smells. Oh yeah, and, as it turns out, the band moved out this week and the apartment below us is now for rent. Overall, things are good. Adjusting to living together has been a funny process for Charlie and I, too. We’ve found we have such a funny collection of duplicate things. Two coffee brewers (the conversation went like this: “Mine makes tasty coffee!” “Mine’s smaller than yours! It fits better!” “Mine matches our other kitchen stuff!”—of course it was all in good spirits), too many knives, and too many Norton Anthologies. We’ve also found a few things that we’re curiously lacking: glasses (as in water/drinking glasses), floor lamps, chairs. As I’m sure any couple moving in together can attest to discovering, one of us is also a little less tidy than the other as well. I bet it won’t surprise anyone to hear how than dynamic breaks down. We’re thinking about getting Charlie a dust buster so that he can follow me around and pick up the trail of debris that follows in my wake. Whoops! We’ve found that we’re also sharing our building with an unusual set of neighbors: a swarm of honeybees! The other night we were getting ready for bed, and I noticed Otto, nose to the ground, following behind a honeybee that was walking along the floor. The next night, there were three in the house, flying around the light fixture. We stuffed the gaps around the air conditioner with towels, and then the next day went outside to see if there was anything out there. Sure enough, in a crack between stones, we spotted a nest of honeybees. We elected not to make a big deal about it, considering the state of honeybees in the world right now, and I have to say, sitting near that window, I love to watch them flying to and from their nest. The towels worked wonders, and we all can coexist happily. Yellow jackets are one thing, honeybees have a whole different benign presence to them. I think that this is about it for now as far as apartment updates go. I have plenty more to share with you all about other things we’ve seen and done since moving here, but those will appear in future posts. Stay tuned for updates about the day hike we took, the play we attended, live (free!) music, and the perils of job hunting. Meanwhile, I’ll leave you with this funny little Boise fact. According to Wikipedia, the climate here is officially semi-arid. Other regions of the world sharing a semi-arid climate include: the Australian outback, Northern Africa, West Texas, and Pakistan. They are doing a military training exercise south of here in which they’ve created a faux Iraqi town, have hired actors, and are going to try to give soldiers a relatively similar experience to that which they’ll encounter in Iraq and Afghanistan. The newsman said that, while the temperatures were on average 10 degrees cooler here than in Iraq, otherwise it’s a remarkably similar climate. So, there you have it. We send our love from little Persepolis. I just wanted to leave a short post on here to let you all know that we made it to Boise just fine. Cat, Charlie, and Ariel are all happy, healthy, and HOT. It's supposed to be 106 here today. That's just WRONG. Lots of stories from moving and pre-moving to share with you all, but since I'm on library-time internet, I don't have the spare minutes left. Rest assured you will hear all sorts of fun things in good time. 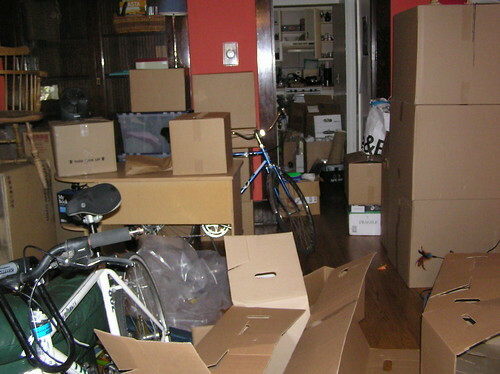 Once we dig out of all the boxes in our apartment and get our internet set up, you'll be the first ones to know. Until then, think chilly thoughts for us.